Both Tahiti and Fiji are exotic South Pacific nations ideal for a romantic getaway, wedding or honeymoon. 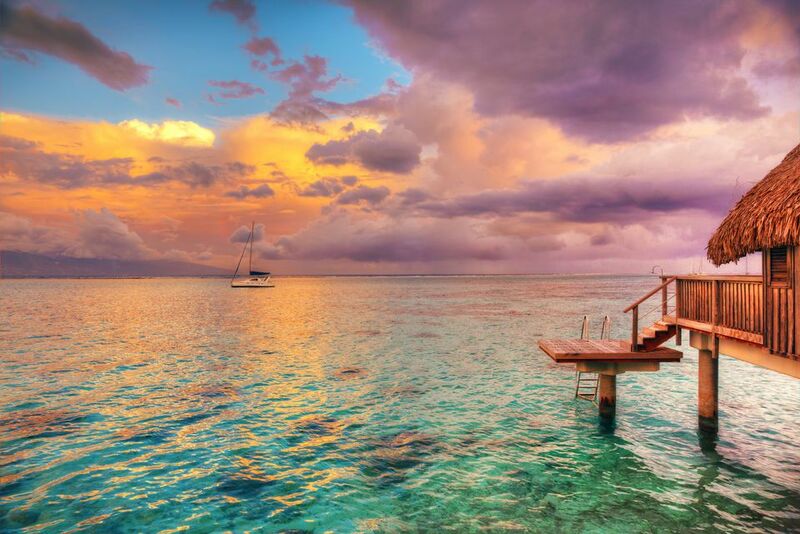 There are great reasons for visiting Tahiti or traveling to Fiji, so which is right for you? Read on for tips and strategies that can help you decide. Both are pretty far out in the Pacific Ocean, but Fiji is farther. The flight to Tahiti's Faa'a International Airport (PPT) from Los Angeles (LAX) is about eight hours and 15 minutes, while the flight from LAX to Nadi International Airport (NAD) in Fiji takes 10 hours and 45 minutes. After arriving in both Tahiti and Fiji, you can stay at a resort on their main islands, Tahiti and Viti Levu, respectively. But to really experience the destinations, you'll want to visit smaller islands, which are mainly accessible by prop planes. In Tahiti, you can reach Moorea via a 30-minute high-speed catamaran, cruise the islands on the m/s Paul Gauguin or fly to outlying islands such as Bora Bora, Raiatea, Huahine and the Tuamotus on Air Tahiti's 48- and 66-seat ATR turboprops. Tahiti invented the overwater bungalow and today there are hundreds located on a dozen islands. Fiji's main accommodation is in bures, traditional thatched-roof bungalows set along the beach or in tropical foliage, but one resort, Likuliku Lagoon Resort, does have overwater bungalows. Nothing in Tahiti is included in the resort's room rate, except the room. A few special rates do include breakfast, and you'd be wise to book one as breakfast can be more than $50 per person. You will also pay quite a bit for lunch, dinner, and cocktails as Tahiti's food prices are notoriously steep. Many of Fiji's private-island resort rates are all-inclusive or include meals but not beverages. Still, ​rates vary widely (from affordable to major splurge) depending on the resort's quality, size, seclusion, and location. At least you have a good idea upfront what your nightly bill will be. Both Tahiti and Fiji offer excellent diving in pristine waters with superb visibility and hundreds of fish species. Most resorts in both have onsite dive shops or work closely with dive operators. Fiji, however, has an edge in one respect: It is known as the "soft coral capital of the world," so its colorful underwater panoramas are world-renowned. If you like your adventure above the surface, both Tahiti and Fiji have plenty to offer. In Tahiti, you'll find that Tahiti, Moorea, Huahine, Raiatea, and Bora Bora all offer hiking and 4X4 safari excursions to the islands' lush interiors, while you can rappel down a waterfall on either Tahiti or Moorea. For the ultimate in adventure, head up to the isolated and lost-in-time Marquesas Islands. Fiji's main islands of Viti Levu, Vanua Levu, Taveuni, Kadavu also offer hiking and eco-adventure. On Viti Levu, you can also kayak or raft the Sigatoka River and soar through the treetops on a zip line. While Tahiti has just two golf courses, one on Tahiti and one on Moorea, Fiji is home to about a dozen, including three championship courses on the main island of Viti Levu. There's plenty of singing and dancing in the South Pacific. Tahitians are renowned for both, using songs and drum beats to tell legends acted out in dance moves that are at times slowly seductive and at others a frenzy of synchronized hip thrusts. Most resorts feature a weekly Polynesian Night dance performance (one of the top things to do in Tahiti) and each July, Tahitians from all islands gather in Papeete for the Heiva, a traditional dance festival. In Fiji, you'll hear wonderfully melodic singing everywhere-especially as you depart and the staff gathers to sing "Isa Lei," the islands' traditional farewell song. If you love what you hear, attend a Sunday church service. Fiji's main dance celebration is called the meke, a series of dances accompanied by singing, hand-clapping, and drum-beating. In Tahiti, the two main ceremonies tourists are apt to see are Polynesian wedding ceremonies at resorts, presided over by a traditionally dressed local priest, and the hima'a earth oven feast (fish, chicken, pork, yams, taro, and breadfruit cooked over hot stones in an underground oven). Fijians still practice a number of ancient rituals and ceremonies. These include the yaqona, more commonly known as kava, drinking ceremony, in which a coconut shell full of kava (made from the crushed root of a pepper plant mixed with water) is passed around to villagers and visitors seated in a circle to the sound of rhythmic chanting and hand clapping. Also, many resorts also feature traditional Fijian fire-walking rituals, a specialty of Fijians from the island of Beqa, as well as lovo feasts, which are cooked in an underground oven just like in Tahiti. It is possible to cruise in both Tahiti and Fiji, although Tahiti is better suited for a traditional cruise experience. In Tahiti, the luxurious m/s Paul Gauguin sails the islands year-round from Papeete on a series of 7, 11, and 14-day itineraries to the Society Islands (Moorea, Bora Bora, Huahine, Taha'a, and Raiatea), the Tuamotu Islands (and the neighboring Cook Islands) and the Marquesas. In addition, Princess Cruises' Ocean Princess does three 10-day cruises through the islands per year. Fiji is not known as a cruise destination, but you can sail the Yasawa Islands on Blue Lagoon Cruises, which sails two casual-themed 68-passenger catamarans on 3, 4- and 7-day cruises. On a larger scale, Dawn Princess sails to Fiji, as well as other South Pacific islands, on 14-day roundtrip itineraries from Sydney.